MUSCAT - Yahya bin Said al Jabri, Chairman of the Special Economic Zone Authority at Duqm (SEZAD), received at his office in the Knowledge Oasis Muscat (KOM) today a delegation of the French Senate, currently visiting the Sultanate. 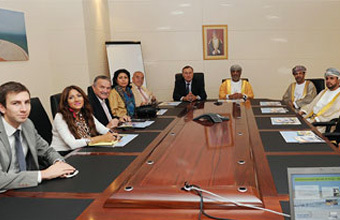 During the meeting, Al Jabri reviewed aspects of the joint cooperation between the Sultanate and France, commending the good relations binding the two friendly countries. He stressed the importance of enhancing them to cope with the aspirations of the peoples of the two countries. He explained that during the years of the blessed Renaissance, the Sultanate has worked to prepare the appropriate atmosphere to attract the foreign investments through packages of laws, legislations and incentives, pointing out that establishing the Special Economic Zone in Duqm comes within the framework of the Sultanate\\'s efforts to diversify sources of income and attracting the foreign investments, as well as developing the Governorate of Al Wusta and achieving the balanced development among various governorates of the Sultanate.